Samaritan’s Purse brings physical relief and the Gospel to hurting people around the world. As a Christian charity, Samaritan’s Purse shares the eternal hope and peace found only in Jesus with men, women, and children who are victims of war, poverty, disaster, disease, and famine. We work in more than 100 countries, addressing critical needs such as food, clean water, shelter, and medicine. We also help hurting people in the United States, including wounded U.S. soldiers and their spouses and homeowners devastated by natural disasters. When disasters strike around the world, Samaritan’s Purse responds immediately, quickly mobilizing staff and experienced relief workers to partner with local churches to provide critically needed disaster relief to people in need. No matter where we go to help the least of these, we always go in the Name of Jesus Christ. We have responded to devastating earthquakes in Haiti, Ecuador, and Nepal; typhoons in the Philippines; and to large-scale refugee crises in Europe, the Middle East, and Africa. We’re also ministering to the physical and spiritual needs of persecuted Christians, children in poverty, women who are victims of domestic violence, and human trafficking victims. Charity Navigator gives us a four-star rating—their highest. 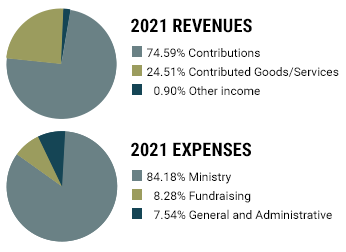 Samaritan’s Purse is a 501(c)(3) tax-exempt charity.